Another London Fashion Week sets up at Somerset House next week, looking ahead to Spring/Summer 2014. The main exhibition and catwalk shows are for industry folk only, although there's always good blagging to be done outside the venues if you're well-dressed or photographically equipped enough. However, for those normal punters who just love fashion, shopping, designer labels and vintage stuff, there are a bunch of LFW-related events going on around London. The bunting has risen above Oxford Street already to flag up its support of London Fashion Week in the form of in-store talks, blogger style sessions, new collection launch events, photo booths and special shopping offers. Visit oxfordstreet.co.uk for a full list of participating shops. Menswear doesn't get a look in at London Fashion Week these days. It used to get one day tacked on at the end of all the women's stuff but now it has its own "fashion week" in January. Regardless, Carnaby Street is running Men's Style Night on LFW eve. Register for your free ticket online here and have a jolly shopping experience enhanced by discounts, live music, DJs and that on Thursday 12 September, 5-9pm. Silent Cinema will screen three fashion films in St Martin's Courtyard on 15-17 September. Zoolander, natch, plus Grey Gardens and Vogue flick, The September Issue. Find out timings and register for your free tickets online here. Peruse The Vintage Collections, spanning 100 years of design, from 50 vintage dealers at The Old Finsbury Town Hall, Rosebery Avenue, EC1 on Sunday 15 September, 11am-5pm, £4 entry. Piggy-backing on the Antiques, Collectors, 20th Century & Art Deco Fair at Alexandra Palace, Pop up Vintage Fairs London will have its own fashion and accessories section within the Great Hall, alongside 400 antique and collectors stalls. It's on Sunday 15 September from 9.30am-4.30pm, tickets £6 (if you're a Facebook follower there's a 2-4-1 deal). At the end of every London Fashion Week, Designer Jumble throws a charity sale to raise money for Just For Kids Law and other charities. Be ready to rummage on Wednesday 18 September from 11am-7.30pm at The Church of the Annunciation, Bryanston Street W1H 7AH. Free entry. Another chance to get your paws on designer togs at up to 90% discount on usual price tag with Designer Sales' Mayfair Sample Sale at 56 Davies Street. Normal entry cost is £2/£1 but special VIP packages are also available if you want to get in early and have a posh lunch with other bargain hunters. It's on Thursday 19 September, 12-8pm. 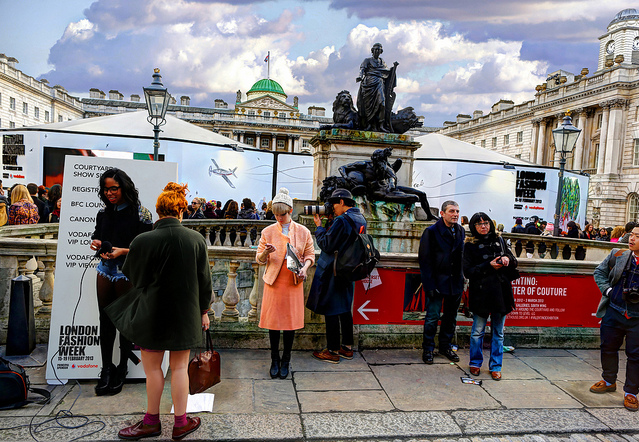 Once the fashionista have left, Somerset House gets set up all over again for London Fashion Weekend — that bit that allows the public in for a taste of London Fashion Week with catwalk shows, discount designer shopping, trend spotting and industry talks. Tickets start from £16 for a shopping-only timed slot but there are lots of packages available. The event runs from Thursday 19 to Sunday 22 September. For a totally different Fashion Week experience, head to South London, where Forest Hill is hosting its own Fashion Week from 20 to 25 September. Look out for two new pop-up shops, styling, sewing and textile workshops, and catwalk shows. Plus, there's always the chance for you to snap up unique designs from talented local traders. Alongside Sydenham and Kirkdale, Forest Hill is part of that Portas Pilot programme, which aims to help ailing high streets. London Fashion Week is at Somerset House and venues around London from 13-17 September 2013. Photo by Anatoleya via Londonist Flickrpool.